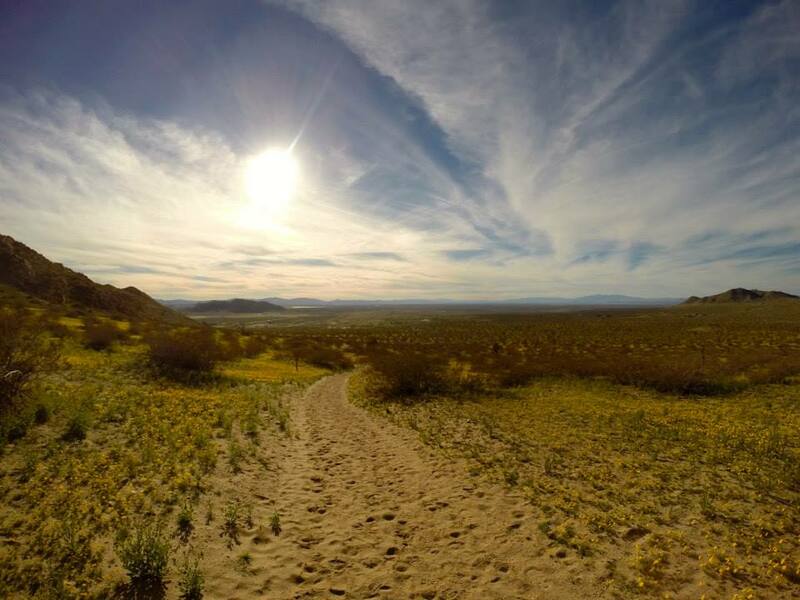 A relatively small and unknown state park, Saddleback Butte has one main hike heading up to the saddle peak of a single mountain. Since it is quite isolated, the views from the top are amazing. You can see the flat desert floor so far in every direction, and the tall, snow-capped surrounding mountain ranges added a nice touch. Located an hour and 40 from LA, the trail is short and not too difficult for anyone. 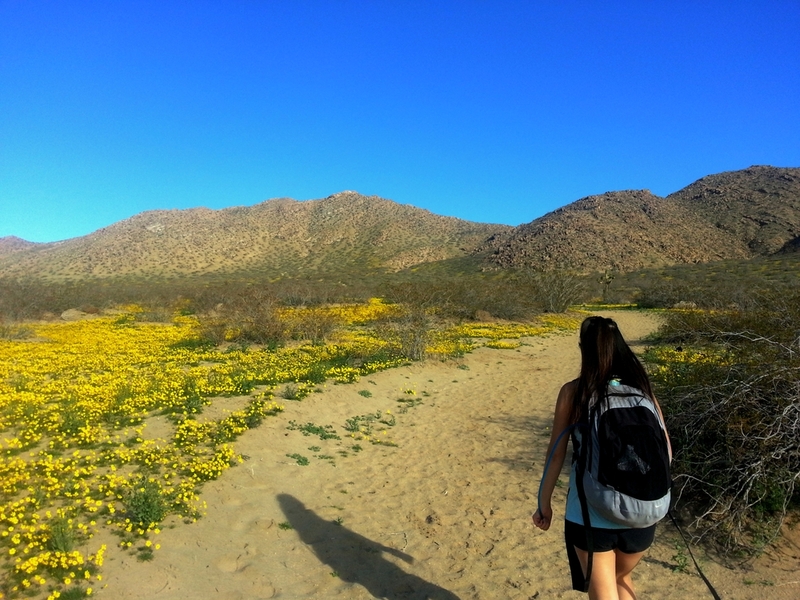 I've never seen carpets of flowers, and what I saw on this hike absolutely blew me away! 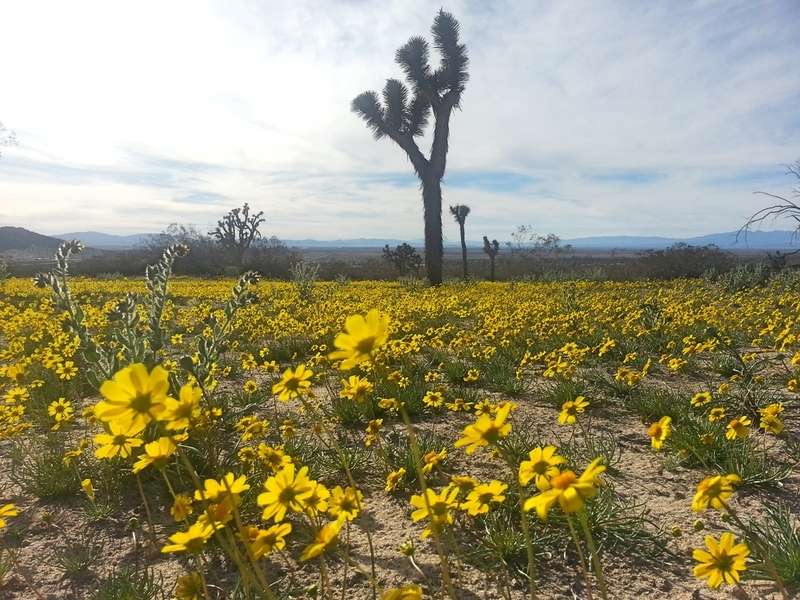 Hoping to catch a wildflower bloom near us, we often follow Desert USA's wildflower report in the springtime. 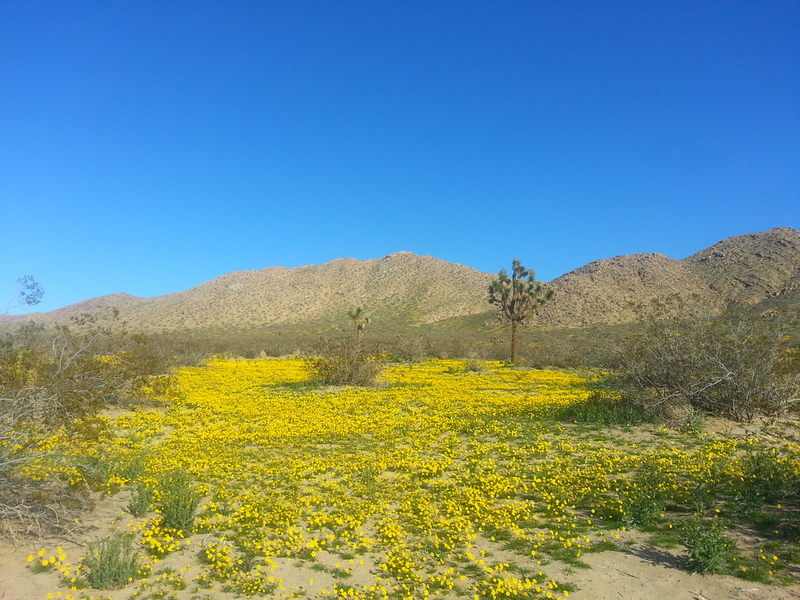 Last year we tried going to Joshua Tree, but even during the peak the flowers were scarce. Reading a report about Saddleback Butte SP, a park we had never heard about the night before, we decided to make a spontaneous trip out the next day. We met up in Corona at noon to pick up a picnic lunch, some fruit, and water. We hit bad traffic in Riverside on a Saturday afternoon, and didn't arrive at the park until 2:30PM. We paid our $6 cash at the day use area and were excited to get started since we saw FIELDS of bright yellow flowers in the distance. Starting from the day use area, we followed a dirt road for 0.9 miles headed towards the campground. 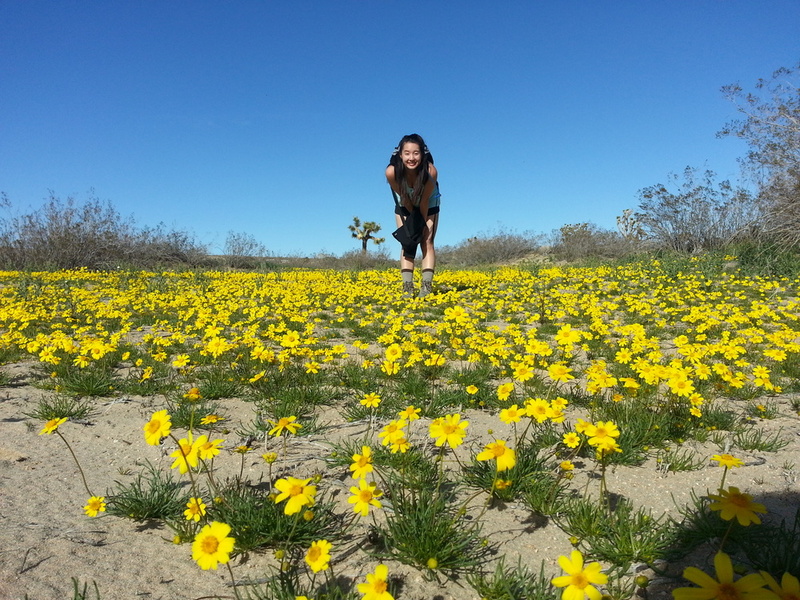 We stopped a lot to take pictures of the yellow flowers literally carpeting the ground. When we reached the campground, we headed up the Saddleback Butte Peak Trail. 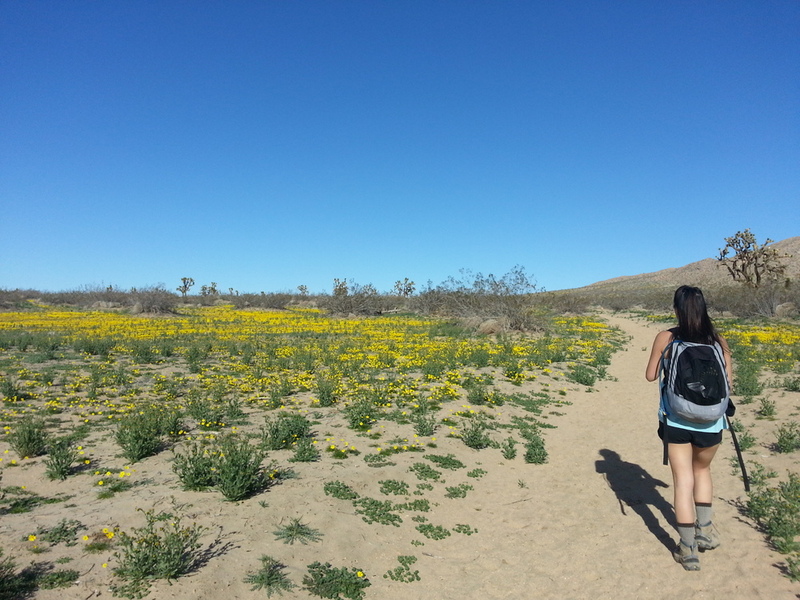 The trail was very sandy and hard on our calves, but the flowers all along the trail kept ourselves occupied. 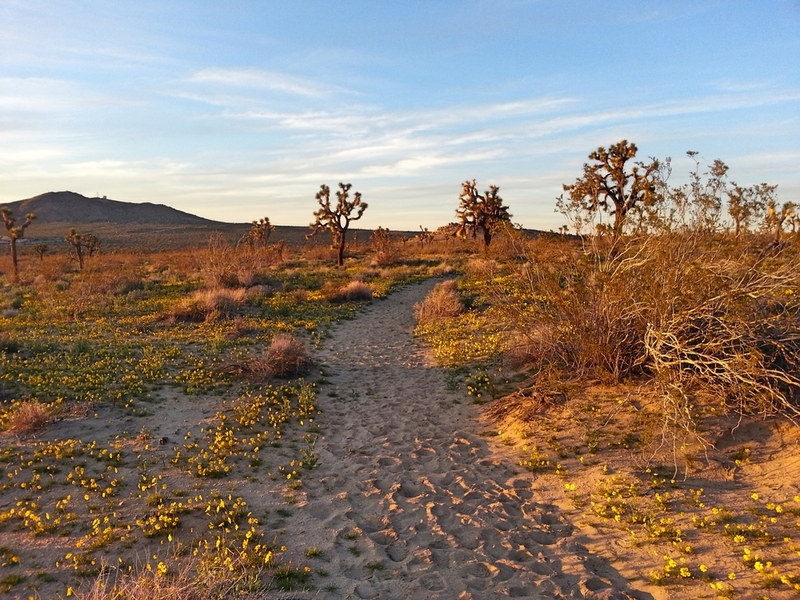 As the trail suddenly got steeper, the trail changed from deep, soft sand to rockier, compact sand. This made for easy climbing, and we turned around frequently to watch the desert floor get further and further away. 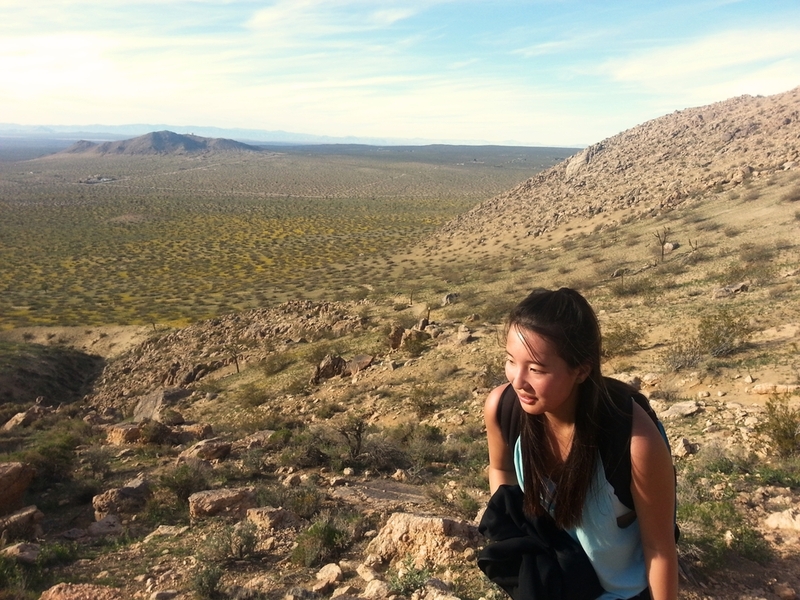 We made it to the top of the saddle and got to see the entire other side of the desert. There weren't as many wildflowers on this side, and it was very windy at the top, so we headed back down a little to have our late lunch and enjoy the views from a rock perch. 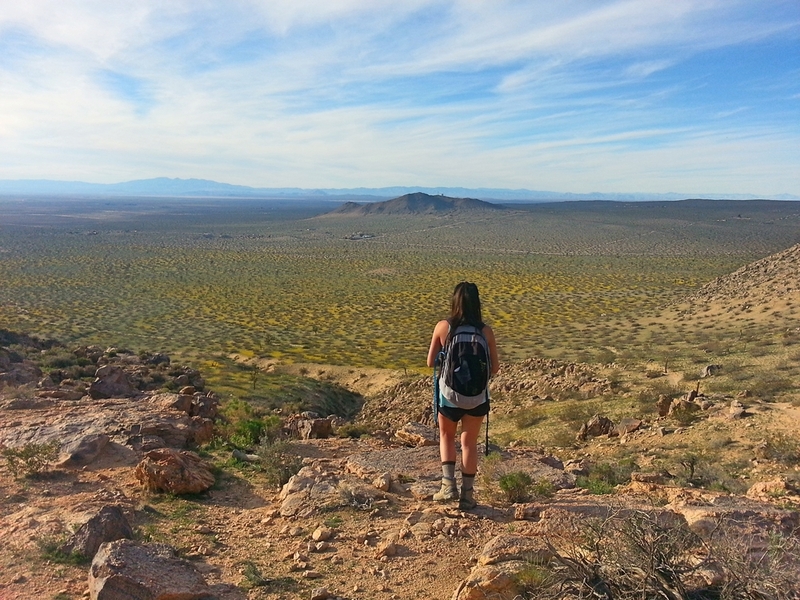 One other couple came up the trail, but other than that we were completely alone on this desert mountain. 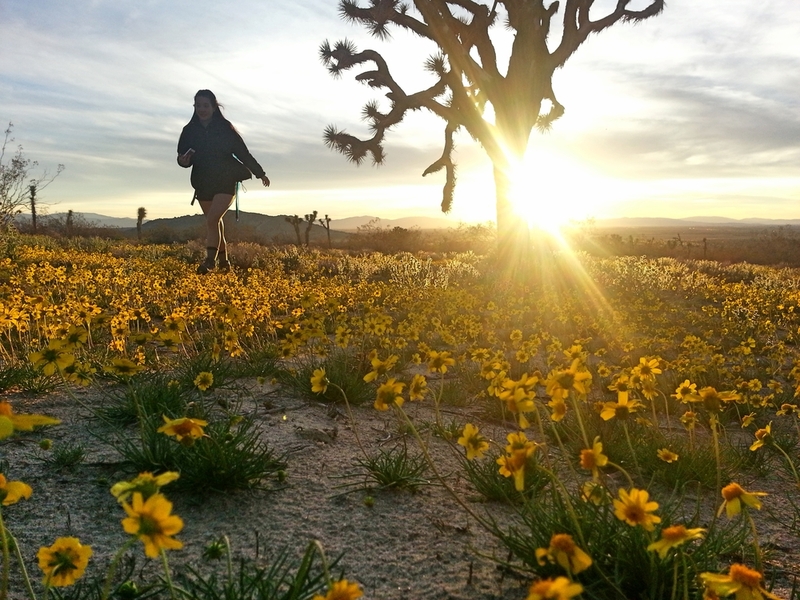 We wanted to catch the sunset from the desert floor to see the flowers, so we headed down the mountain. Even though we knew we parked in day use area, we couldn't help but enjoy the sunset from the flower fields. The hike back to the car was only 2 miles from the 4 way junction with the horse trail, which ran alongside a wire fence. It got dark quickly and we tried to make it back to our cars. We hiked up and over little butte, and watched the sky turn colors. The clouds were incredibly pink and contrasted with the purple mountains and yellow flowers. We finally made it to our cars and quickly got in. When we got to the front gate, it was closed! Thank god for the dirt road that we initially hiked to get to the campground. We drove to the campground and out that entrance. We definitely were not prepared to spend the night, and could not imagine what we would have done if the campground was not connected! Since it was both our first times seeing wildflowers like this, we were so happy we were able to make it out here. The hike wasn't too difficult, and was perfect for a short day excursion. 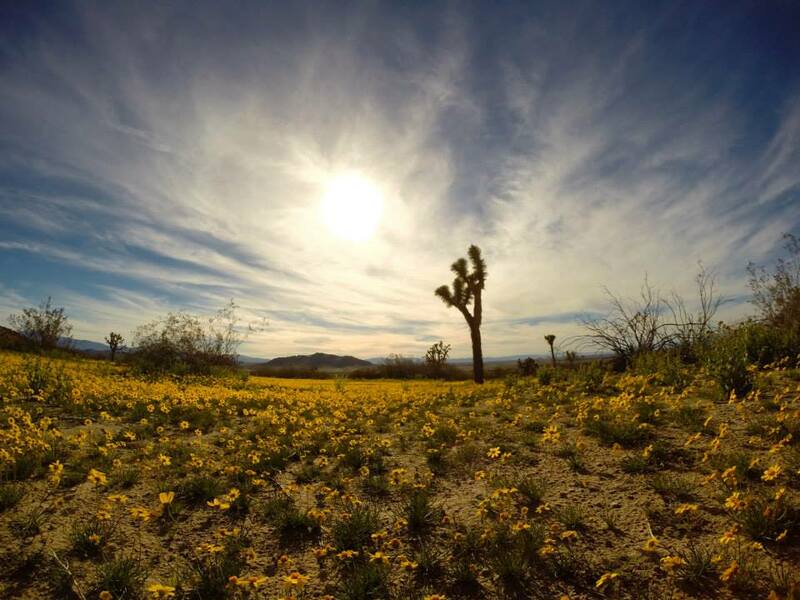 Seeing the carpets of wildflowers covering the mountain side completely changed our view of the desert being an empty, barren landscape.